HALAL NUTRACEUTICAL PRODUCTS: WHAT DETERMINES CONSUMERS’ INTENTION TO PURCHASE? The advancement of food technology allows for the growth of beauty and health products. As the society places more concern on product security, nutraceuticals become an option. However, what is considered safe is not necessarily halal. 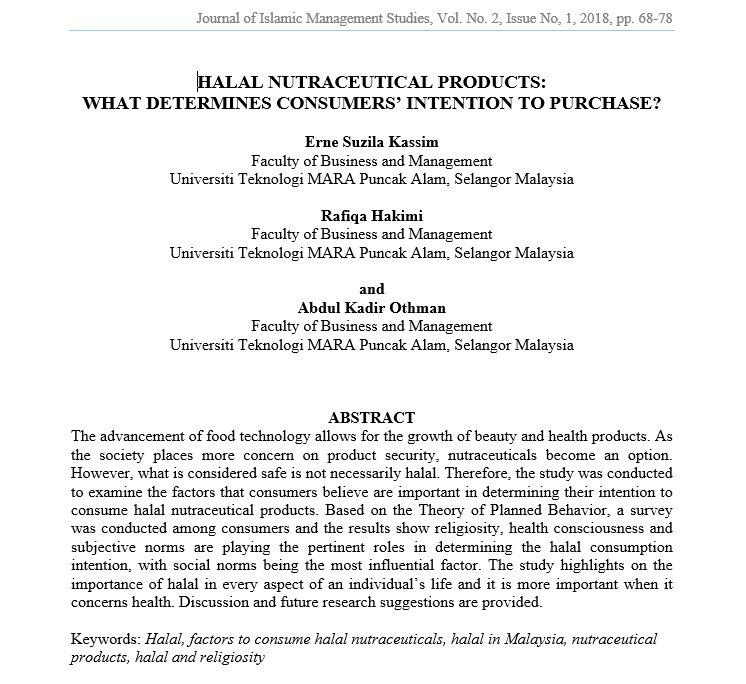 Therefore, the study was conducted to examine the factors that consumers believe are important in determining their intention to consume halal nutraceutical products. Based on the Theory of Planned Behavior, a survey was conducted among consumers and the results show religiosity, health consciousness and subjective norms are playing the pertinent roles in determining the halal consumption intention, with social norms being the most influential factor. The study highlights on the importance of halal in every aspect of an individual’s life and it is more important when it concerns health. Discussion and future research suggestions are provided. KASSIM, Erne Suzila; HAKIMI, Rafiqa; OTHMAN, Abdul Kadir. HALAL NUTRACEUTICAL PRODUCTS: WHAT DETERMINES CONSUMERS’ INTENTION TO PURCHASE?. Journal of Islamic Management Studies, [S.l. ], v. 2, n. 1, p. 68-78, mar. 2019. ISSN 2600-7126. Available at: <http://publications.waim.my/index.php/jims/article/view/100>. Date accessed: 24 apr. 2019.